The November Membership Mixer will be held at Wurstfest on Tuesday, November 7 from 5:30 to 7:30 p.m. 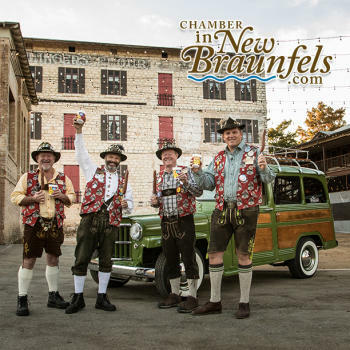 Enjoy some oompah music, delicious sausage, fun hats and all that Wurstfest has to offer while getting to meet and mingle with other Chamber members. A printed invitation has been mailed to all Chamber members. You must present the invitation at the gate for admission into the Wurstfest grounds for one Chamber member and one guest, and you can redeem the invitation for 20 complimentary drink tickets. Plus we’ll be drawing for $50 for one lucky Chamber member. So put on your lederhosen or your dirndl and head out to Wurstfest for some food, drinks, fellowship and a whole lot of fun. Wurstfest officially kicks off Friday, November 3 at 4:00 p.m. The opening ceremony is at 5:00 p.m. with the ceremonial biting of the sausage! Grammy-nominated polka virtuoso Alex Meixner hosts this annual tradition to celebrate the official Wurstfest opening with the biting of a string of dozens of locally made sausages. A symbolic keg of beer is also tapped and shared with the crowd during this fan favorite.